More details in our Media Kit. Any questions about advertising? Advertising for the first time? We are a specialised Brussels job site, with a very focused readership. Our readers are all multi-lingual experts, actively looking to improve their career opportunities in multinational organisations - and their life style while doing this. You can reach this interesting audience through our various offerings of strong visible website and newsletter exposure. Are you recruiting? Find all needed information on how to advertise specific jobs in our recruitment section. Any questions about advertising? Email us at info@eurobrussels.com or call us on +32 2 790 3200.
we got through your website. 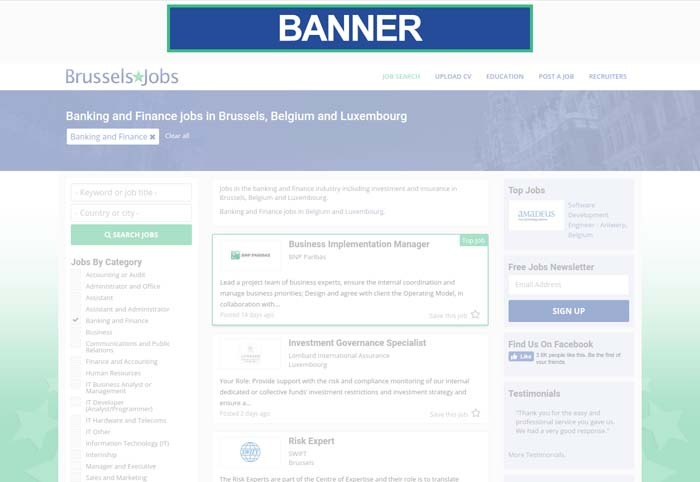 Placing a Leaderboard website banner on BrusselsJobs will give you access to this large but still extremely focused audience at very competitive rates.